The American Robin is a member of the thrush family, which also includes bluebirds, solitaires and the wood thrushes. The American Robin was named by early colonists for the European Robin they left behind. The two are only distantly related, but both have red breasts. The American Robin can be found throughout North America at some time during the year. 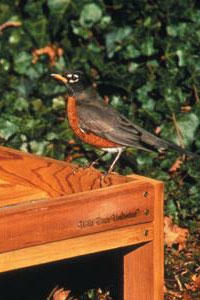 Male robins have a dark gray to almost black back and tail with a rust/brick colored breast. The female is paler all over. The juvenile robins have a spotted breast. American Robins living in the western states tend to be paler in color and often lack the white markings on the outer corners of their tail. While the majority of American Robins migrate to the south each fall, a small number of stragglers usually remain behind and endure the winter. The majority of over-wintering robins are males trying to ensure they have first choice of nesting territories in the spring. Females migrate to areas where food is more abundant to help ensure they are in top condition for the rigors of raising young in the spring. Male robins that migrate usually arrive on the breeding grounds up to two weeks before the females return. American Robins migrate in flocks primarily during the daylight hours. Robins are attracted to open lawns and gardens with mature shrubbery and trees. While they eat a variety of insects and berries, it has been noted that robins can eat up to 14 feet of earthworms in a day! Worms only make up about 15%-20% of the summer diet for American Robins. You will likely find robins in your yard after a rain or after the sprinkler has been on or even after the lawn has been mowed, as this brings worms and insects to the surface. Most of the earthworms found in North America today did not exist prior to European settlement. They were imported mainly from Europe by early settlers. The worms or worm cocoons traveled in the rootstocks of plants brought by the settlers from their homelands. They were also released into the new world through soil that was used for ship ballast that was discarded after the voyage to the new world. Robins can be attracted to a feeding station by offering mealworms, fruit and a birdbath. It’s especially fun to offer mealworms during nesting season when the robins can stop and pick up a mouthful of tasty worms to take back to their babies. They will fill their mouth until you think nothing else could possibly fit inside and still continue to try to pick up more, dropping some in the process and then trying to pick those back up. It can be very entertaining! Robins change their feeding habits depending on the time of day as they will eat more earthworms early in the day, when they are easier to find, and then switch to fruit later in the day. Only the male American Robin sings, but both sexes have calls and alarm notes. You typically hear the robin first thing in the spring in the morning and last thing before dark. On average, over 50% of all nesting attempts by American Robins fail to produce young. Out of the successful nesting attempts, only 25% of the fledglings will survive until November. Unlike most birds, robins do not lay their eggs at sunrise. They lay their eggs several hours later during the mid-morning. Since earthworms are easier to find in the early morning, they feed first thing in the morning and then return to their nest to lay their egg.